Today, I'm showcasing something of my own creation, or shall i say borrowed and then added upon. This darklance warrior was inspired by the current lack of an accessible or even good looking model at that. The current Metal mini which is not supplied with the plastic box is disproportionate and lacking in detail in my opinion if not even disproportionate, seeing the gun is larger than the warrior by far. (the only upgrades available int the box are one for a sub par looking sybarite, and a splinter cannon, which effectively is a 4 shot bolter). This conversion incorperates a quick removal and repositioning of the hand holding the splinter cannon, then the standard rifle support arm placed on the underside. the end of the barrel was then flattened to allow for an upside down splinter pistol to be attached. This goes against the current look of the dark lance, but i feel that it adds a bit of detail to what in my opinion is a very bland gun to begin with. 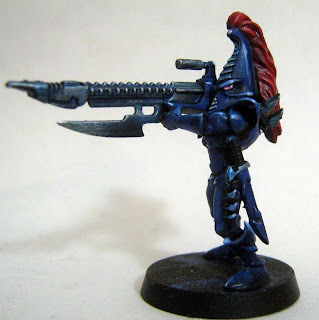 The Paint scheme as shown on this model is what i have in mind for the warrior units, predominantly blue with hints of red and metallic blue, the models feature none of the purple that is shown on the wyches. I wanted to make a contrast between the units, just to show that they are separate from the army and not the mainstay. 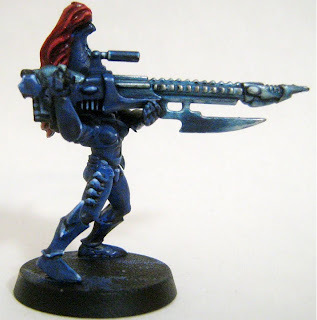 In the picture above you can see that relatively little work needs to be done to convert a splinter cannon into a dark lance, there is no green stuff applied no shaving or reworking of the joints, just a simple maneuvering of the arm to hold the gun over the shoulder. Hopefully by the end of today i'll have some more pictures of the completed unit of reaver jetbikes to post, till then, food is in order, so i'll leave it at that, hope you enjoyed this simple conversion, very effective in both cost and visuals. Take care!